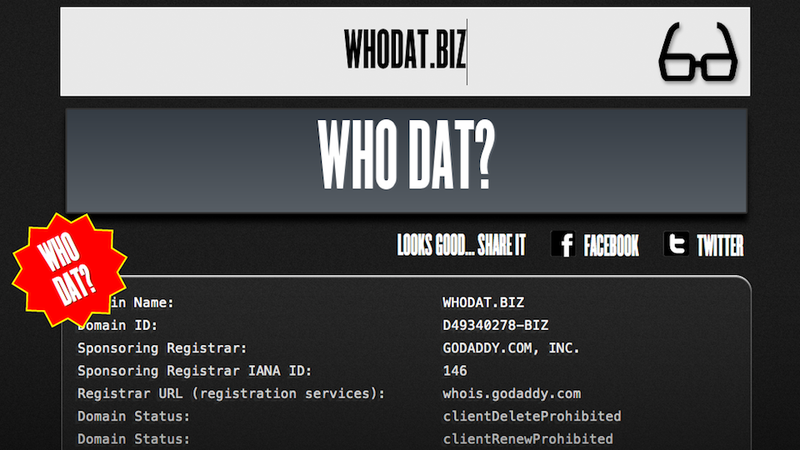 Everyone's chattering about Whodat.biz, the new site claiming to be from Kanye West's insane tech startup Donda. By everybody, I mean The Washington Post and Twitter, which went bezerker over it, and, well, us. But Whodat.biz? Oh come on, now. If this ain't a hoax, I'll eat Kanye's doo-doo. This Can&apos;t Possibly Be Kanye&apos;s Insane Tech Start Up, Can It? We confirmed with a Donda project representative that the WhoDat site has nothing to do with them. (Update: So did Buzzfeed.) But was that even necessary? I mean, how could anyone not realize this was a fake? WhoDat is a self-described "Facebook for Websites" but is basically nothing more than a Whois service that returns website lookup information. That's the new business model? I mean, first of all, nobody is this dumb. Not even Kanye West. Second, the Twitter and Tumblr accounts just launched yesterday. Also the Google Analytics ID—increasingly a tool used to expose the true owner of a Website—is concealed in the site's source code. That's not a smoking gun, but it's suspicious. And of course, Kanye West hasn't addressed this at all from his Twitter. Which is suspicious, no? I mean, have you ever known Kanye to not self promote? And look how Donda reacted to getting trolled. It doesn't exactly come across as genuine naiveté. So who exactly is behind it? We don't know. (We do now! See update below.) I emailed the address @DondaMedia was handing out to talk to the person behind the account. Their response? This is not Kanye, we are a group of minds who work within the vision of Kanye West. Did u just WHODAT me? So I called! And spoke with Ryder Ripps one of the founders of OKFocus, the group behind the hoax. Ripps says the prank just "played into a lot of people's assumptions about Donda" and that their goal was just to reinvent something old—a Whois lookup—in a new and playful way. (And presumably, to put OKFocus on the map? Well done.) He also said the group hasn't heard from the real Donda. Sorry, Internet. This wasn't real.